(Newser) – Diagnosing Alzheimer's is a guessing game—and many doctors are guessing wrong, according to early results from a new study presented Wednesday in London. The Washington Post reports doctors tested 4,000 Medicare patients with mild cognitive impairment or dementia and discovered many of them definitively do not have Alzheimer's. Using PET scans, the study revealed only 54.3% of mild cognitive impairment patients and 70.5% of dementia patients had brains containing amyloid plaques. 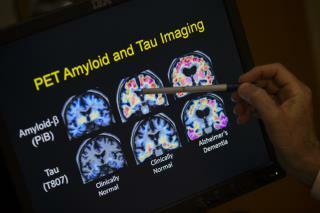 These plaques can be a sign of Alzheimer's. The patients who had them may or may not have Alzheimer's; the remaining percentage definitely don't have the disease. "To get that right diagnosis, that's really important," one woman, whose Alzheimer's diagnosis was ruled out by a PET scan, tells the AP. So here we have a disease that no one knows the cause of, and that there is no treatment for. Why are articles like this published? Spinal tap? Had one once, and know one is ever doing that to me again. I'd rather die.